Love the great sharpness...nothing to dislike! Chopping anything at all is great, even raw meat: tried to make meat into hamburger with a grinding attachment, failed ... thus used the CLEAVER to chope the raw meat fine!! Great tool! Highly recommend, at the lower price I paid. If you're a serious kitchen dweller, cooking and chopping often, you'll love it. If you don't cook much, its not really essential! Anyway, my thoughts ... it's a luxury item, that speeds up the onerous task of chopping ~ anything! "Chef Stainless Steel 7-inch Chopper Cleaver "
Chop recipe ingredients easier and faster with this stainless steel chopper cleaver. Featuring an ice-tempered stainless steel blade, this cleaver offers precision cutting that will have you chopping like a professional chef. This was a great addition to my wife's knife set. My brother in law is a chef and he told us that this steel chopper was of very good quality and very well priced. We really like these knives. We find all kind of uses for them. My brother in law uses ours every time he cooks at our house. I never enjoyed food prep until now. This is a fantastic kitchen tool. Chopping onions, carrots, cabbage, celery, and potatoes is much easier tha using a Chef's knife. Great quality, but HUGE ~ too huge for my hands. I wanted to be a CHEF who can cut up veggies fast and perfect. Nope! There are times kitchen knives and scissors just won't do the job when cutting up meat, chicken, etc.. Fortunately, shortly after I struggled cutting up a whole chicken, I saw this advertised and from the description decided it was just what I needed! It is very well made, does a good job and will last me a lifetime. Am so glad I saw this on your website! 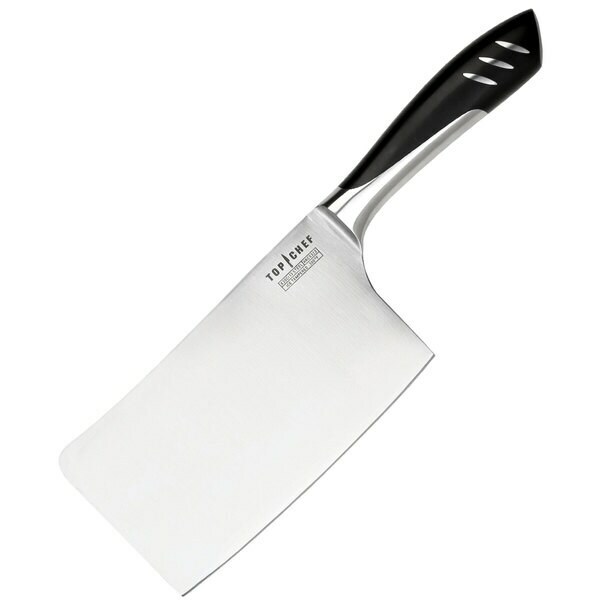 This is a great meat cleaver. Very sharp. Nice weight. I’ve had it for a while now . Very good buy. I bought this as part of starter set. This kitchen tool look great and is well proportioned for the hands of the cooks in our house. It serves all our needs for chopping, cutting and splitting efficiently. Nice weight, blade seems sharp, appears to run through handle, hope it lasts. It cut up my chicken like it was made of paper. Love it. Excellent knife. Extremely sharp and feels good in your hand! Very balanced handle. Heavy weight. Very nice and sharp for household use. Great Knife! Love the way the knife is made. Can’t wait to use it for the holiday. I have needed a chopper for a long time. I need it to carve backed pork. I hope the metal in blade and the in the handle are all one piece. They look like they are of good quality, but I won't know until I receive it and use it to cut up a roasted pig baked Filipino style.